The Review Steering Group met on 15th March and a range of actions were agreed. We noted that regulation of muirburn started as far back as 1424; the Steering Group's overall aim is to modernise the way we approach muirburn to make it fit for the requirements of 2016, and beyond. We also need to link the benefits of muirburn to minimising the number of wildfires and their impact. Muirburn is not just about conservation, sporting enterprises or farming; it is essential that we embrace all current and potential land uses. The Group will be making sure that recreational and landscape factors are brought into consideration alongside all other interests. Before a decision is made to employ muirburn techniques, we will be recommending that an assessment is carried out to consider the potential benefits from muirburn against the possible risks. Also, it will be important to make sure that effective measures to control a fire, once lit, are in place. 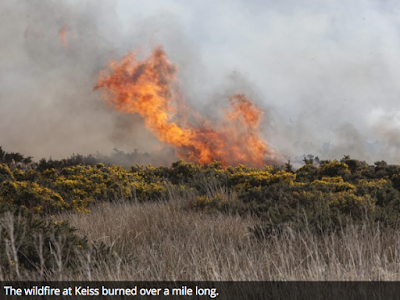 A similar assessment will need to be carried out before deciding to use cutting to manage vegetation. Cutting is not without its risks and potential problems and these need to be considered alongside the potential benefits before starting work. The Group has started work on drafting a revised version of the Code. A new feature will be additional guidance that will be published to support the revised Code, and drafting has also started on these sections. The topics will include how to use muirburn as part of peatland, and grazing management. This will allow more detailed guidance to be provided on specific topics without burying the key messages of the main Code in additional information that will not be relevant to everyone. The aim remains to publish a draft of the revised Code by the end of August, this year, and then to test the Code during four workshops, which will be held in different parts of the country. The venues have yet to be decided and any suggestions will be welcomed.